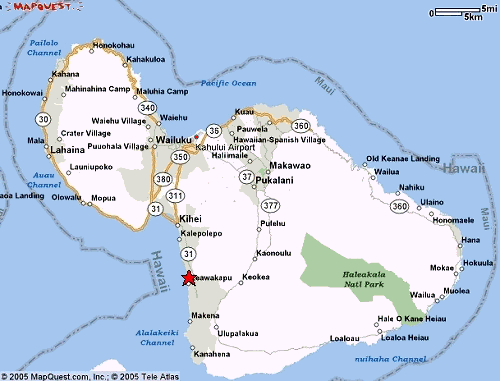 Our condo is located at: 2737 S. Kihei Rd., Maui, HI 96753. It is situated on the leeward side of the island of Maui with Mt. Haleakala to the east and the Pacific Ocean to the west. Kamaole Beach Park is just a few minutes walk from the condo. This is the sunny side of Maui, also known as South Maui's Gold Coast. Kihei is approximately 30 minutes drive from Kahului Airport and about 40 minutes from Lahaina. The location provides for an above average number of sunny days helping to ensure a pleasant stay in this tropical paradise. View a more detailed map of our condo's location. Get directions to our condo from Kahului Airport.